Aluminium is the most abundant naturally occurring metal found in the earth’s crust and it is a widely used material in the modern world. Aluminium has many benefits for construction and home improvement which has seen it rise in popularity in the UK over uPVC and timber. 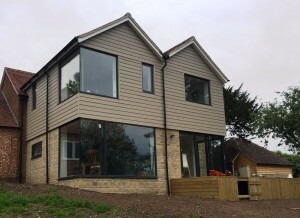 Here at Lite Haus, we only recommend aluminium when it comes to choosing your windows and doors as it guarantees quality and style whichever product you choose. So why are our aluminium windows and doors better? With a high strength-to-weight ratio, aluminium is a great material for building sturdy windows and doors. Much stronger than wood or plastic, aluminium is highly durable and scratch resistant, offering a guarantee that your frames will last for years to come. This reliable material is an affordable long-term investment for frequently used bi-fold doors or ventilation windows that would be prone to wear and tear. To back this up, our aluminium doors come with a 10 year guarantee. The properties of aluminium allows it to be easily shaped, which means you’re not limited in the choice of design when working with this material. The lightweight nature of aluminium, combined with its strength, is ideal for creating slim frames for a large glass surface. it takes to produce the primary metal during the recycling process. Aluminium frames only require limited care to keep them in top condition. Unlike cheaper alternatives that may look worn out over time, the durable properties of aluminium means that your frames will maintain its ‘just installed’ appearance and never give away its age. Energy efficiency is an important consideration for homeowners, particularly when you’re selling your home. Our modern aluminium doors are fitted with a polyamide thermal break system to resist thermal transfer and effectively keep in the warmth to reduce your energy bills. Aluminium window frames are also suitable for double and triple glazing, so you can guarantee thermal efficiency throughout your home. Our aluminium windows and doors are very popular for the modern and sleek appearance they add to any home. Thin aluminium frames allow for a high glass-to-frame ratio that maximises your view and natural light. 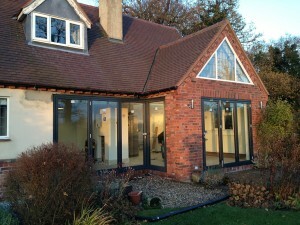 Bi-Fold Doors or Sliding Doors? The Pros and Cons Grand Designs Live 2017 – We’ll Beat Your Quote!